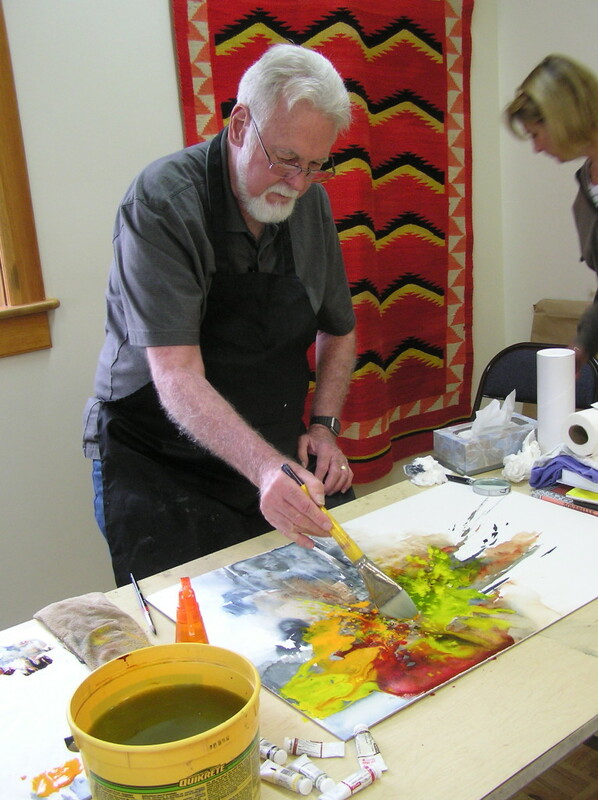 I just had the good fortune to spend three days at the Bennington Center for the Arts immersed in color and creativity. Morten E. Solberg was the featured artist at the Art of the Animal Kingdom XV exhibit. What a delightful human being! Astonishingly capable, easy going, FUNNY! and generous of spirit. 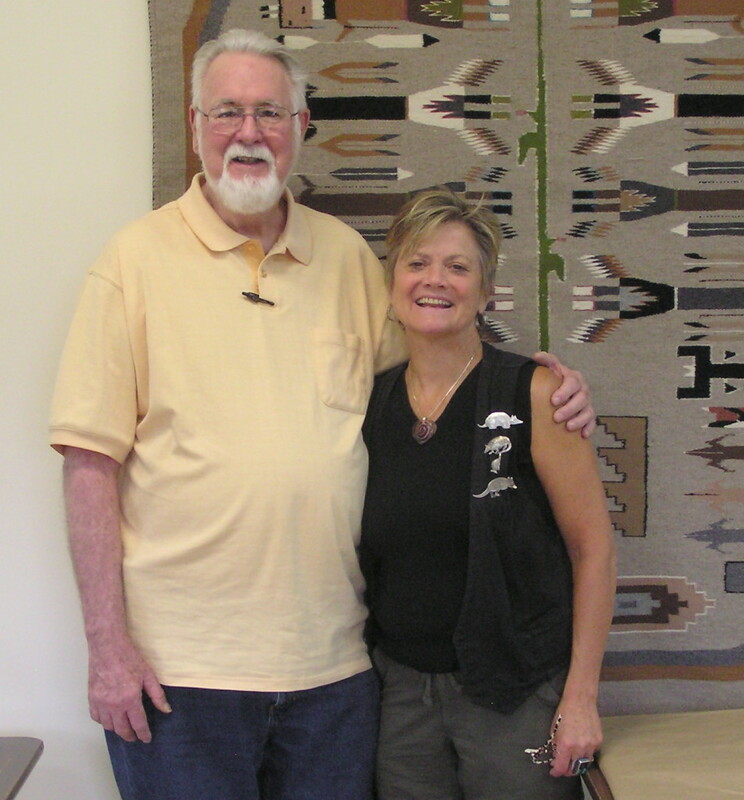 While he demonstrated, shared his expertise and advised, he told wonderful stories about his adventures with elephants in the wilds of Africa and bears along wilderness trails in Alaska. Mort is also quite the prankster (though he didn’t practice too much on us!) He entertained us with tales of past practical jokes that had us in stitches. Stories that Mort shared about the evolution of his career were also illuminating for artists at other stages along the path. What a life! In his paintings, somehow Mort manages to merge spontaneity with precision in the medium of watercolor. From a loose, fluid beginning, gorgeous, intimate details emerge. 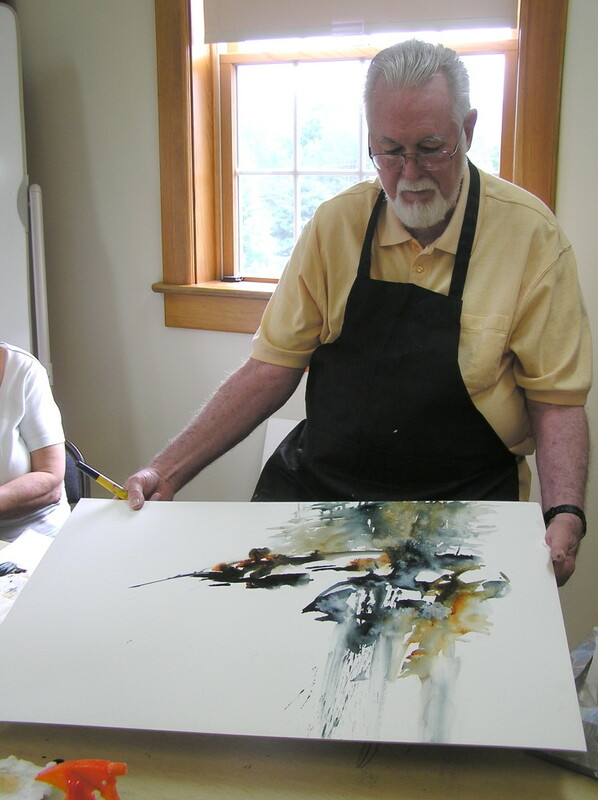 Watching him paint was like observing a slow, interactive dance… Each time the brush flowed across the white of the paper was followed by long, thoughtful, quiet moments while he assessed the effect and determined the next action. 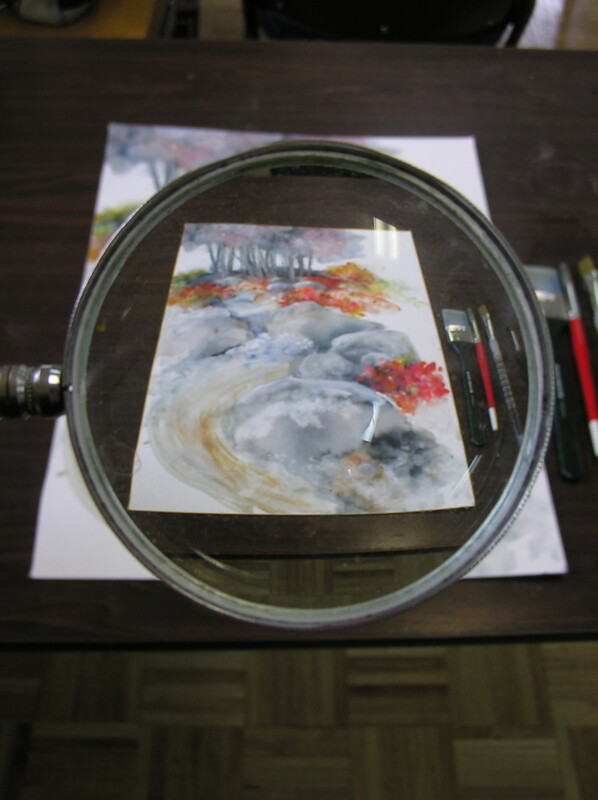 He also used a “reducing glass” to see the entire image, while deciding how to proceed, a technique he developed when working in a small studio. The diversity of color and texture Mort creates with rich transparent washes is amazing. Several layers of these stroked, splashed and splattered colors are how the paintings begin. However, not always bound by the RULES of transparent watercolor, Mort also uses opaque colors, white gouache and acrylic gesso in his work. That was a liberating concept. When he splashed intense cadmiums on top of glorious washes of Payne’s Gray and Burnt Sienna we all gasped! But then from the chaos of color he very intentionally (and ever so successfully) eked out a dynamic composition. He is a great teacher.. very articulate and able to explain his choices and processes. And fun! I had been hoping to meet Mort and learn from him for years. Lucky Day for me when the Bennington Center for the Arts made him the featured artist for Art of the Animal Kingdom XV! The BCA always puts on a grand show, treating art and artists with great respect and kindness. Spending time in the galleries there is immensely uplifting. Thanks Mort, for a great workshop and for sharing your wonderful work! How interesting ! Will be off to have a look at his work. Had never thought of a reducing as opposed to a magnifying glass. I haven’t visited your blog before but am enjoying reading over the past entries.